I created Dee W. Ieye for a fundraiser I did in Hollywood in 2004 called Best in DRAG Show. I was never going to play her again, But a friend of mine saw the show and he was selling Tupperware in drag. Long story short, he convinced me to start selling Tupperware as Dee. I soon became the # 1 Selling Tupperware rep in the USA and Canada and held that position for 4 years in a row. Booking out sometimes 3 months in advance and doing 17 parties a month. Dee sure knows how to sell plastic! Now she’s Tupper Famous and quite a celebrity because of it. She was even on the revamped TO TELL THE TRUTH in 2016 with Betty White. So in 2012 my husband Geoff and I – after much deliberation and thought – decided to move back to my home town Columbus OH. Los Angeles had become too difficult a city to live in. 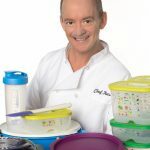 My Tupperware career as Dee had completely replaced my acting career as Kevin and we really wanted a better quality of life. Plus I got to be closer to my family and my aging parents. So, now I sell in Ohio and the surrounding areas. I travel to LA, Vegas, Chicago and other cities to do my show. And now are offering my talents as Dee to groups as fundrasiers! Being back in Ohio allowed me the opportunity to expand my Tupperware brand into Kevin’s Kitchen. Where I get to step out from under Dee’s wig and offer cooking demos as Kevin to smaller groups. We do simple easy recipes highlighting my favorite items. Cooking – storing – reheating and organizing. Being out from under the wig has also allowed me the opportunity to meet people who want to use the Tupperware opportunity to benefit their families. Either by selling or by taking advantage of our wonderful product pricing.